I absolutely love the monthly pug meet I take Ref and Serina too. The group is filled with amazing people and awesome pugs. But what makes them even more awesome is that they are willing to help raise money for any chosen charity. 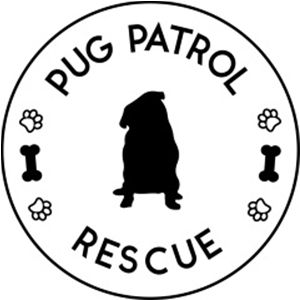 So if you are part of an amazing pug meet group and want to raise funds for a charity but not sure how to do it then this is the post for you. I am sharing my tips on how to organise a fundraising pug meet event for charity. Choosing a charity that you want to help is the easiest part. If you are organising the whole event yourself, then you can choose which charity you want to help yourself. But if you are doing it with some of the people within the pug meet up group then collectively deciding is the way to go. Just be sure to choose a charity that is a registered one so that everyone contributing to the event knows they are a genuine charity. 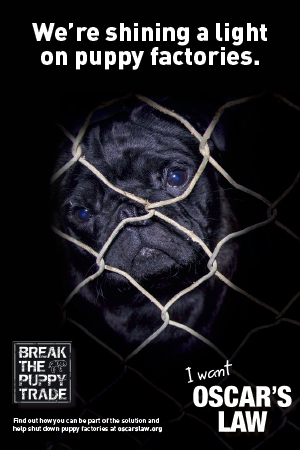 A great way to go is with your local pug rescue group. 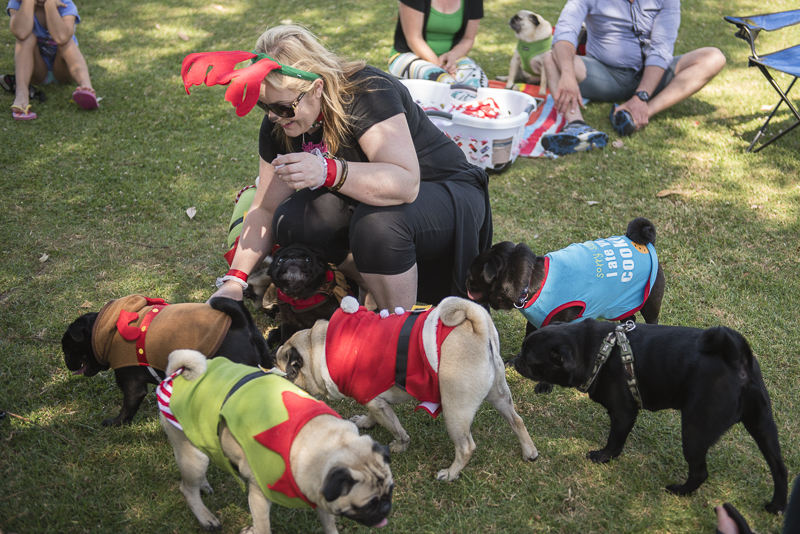 This may seem obvious but there are many ways you can host a fundraising pug meet event. The first thing to decide is whether it will be an event for both pugs and humans or just humans. Once you’ve decided who the event caters for then you need to choose a location. I enjoy the events where the pugs can come along and join in with the fun. Don’t forget to choose a date and time for the event too. This can be the most difficult part. Asking businesses to donate products to the event means you need to already have a relationship with them or you need to build one. They are risking their business reputation to support your cause so making sure they can trust you is a high priority. When you approach a business about donating products, put everything in writing so they know exactly who you are, why you’re asking them for product, who you are raising money for and what you are looking for. And most of all, let them decide how they can help you by having a number of options available for them to choose from. And always thank them for their support with your cause even before they donate to you. Last year I hosted 2 Christmas fundraising events for 2 different pug meet groups and I sold showbags, photos and cookies for the pugs. So I was looking for items such as products and vouchers that added value to 50 showbags. I had 10 businesses contribute to these bags. 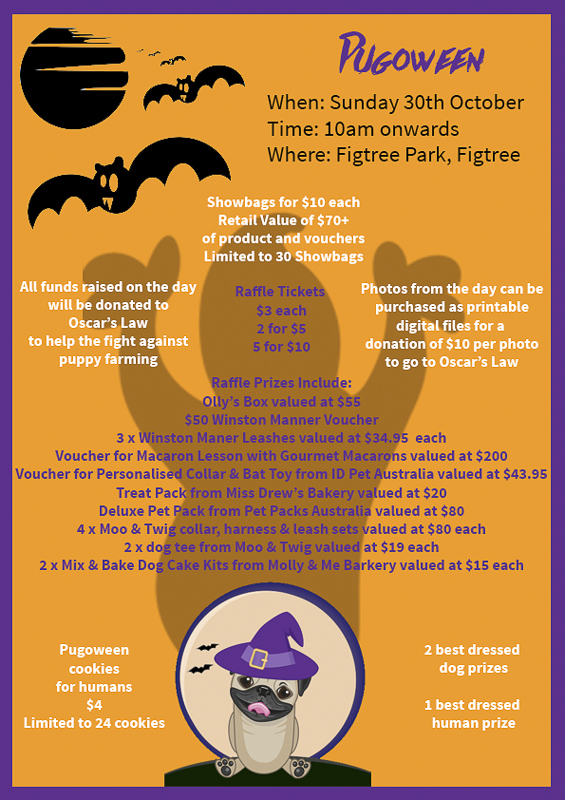 This year I am organising Pugoween fundraiser for the Wollongong & South Coast Pugs group. This time round, I was looking for items for 30 showbags as well as higher valued items to use in a raffle. Whilst there are 12 businesses contributing this time, there is a lot more on offer. I had businesses contributing to the showbags as well as to the raffle. With all of the raffle prizes, showbags, cookies and photos on offer, I am hoping we can raise over $500 for our chosen charity of Oscar’s Law. I have to say though, all of the businesses I contacted to help with the event know and trust me. I have built a relationship with most of them over the last couple of years. And that is the key. The relationship can be built through buying from them regularly, interacting with them on social media or like me, through blogging if that is something you do. Now this is somewhat of the fun part but also a little challenging. If your pug meet group has a Facebook group or Instagram then this is the first place to start promoting the fundraising event. Create a Facebook event for the group and be sure to invite all members so they all know about it. Create a flyer that you can share on Facebook, Instagram and in person that shares everything from date and time to what’s on offer, who you’re raising money for and participating businesses. On social media, be sure to tag the participating businesses so that people can follow them and hopefully you’ll find that those businesses will share it as well. 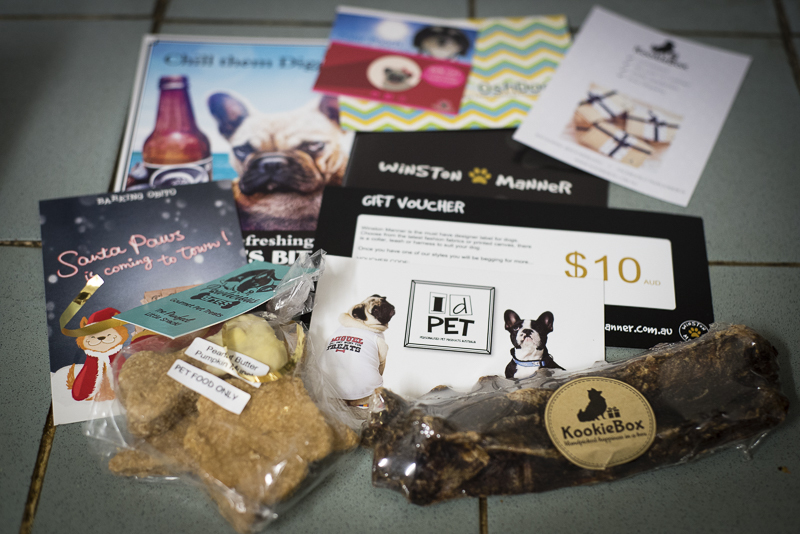 The flyers you create can be printed and handed out at pug meets leading up to the fundraising event. If you can, print and laminate a copy that can be put at the location of the event. This is hands down the best part. Enjoy the day you’ve created. Have fun watching the pugs and humans enjoy the company of each other. Be sure to take photos to share amongst social media. This is the most rewarding part. Counting the money and then donating it to your chosen charity. Be sure to put together a nice letter explaining how you raised the money. 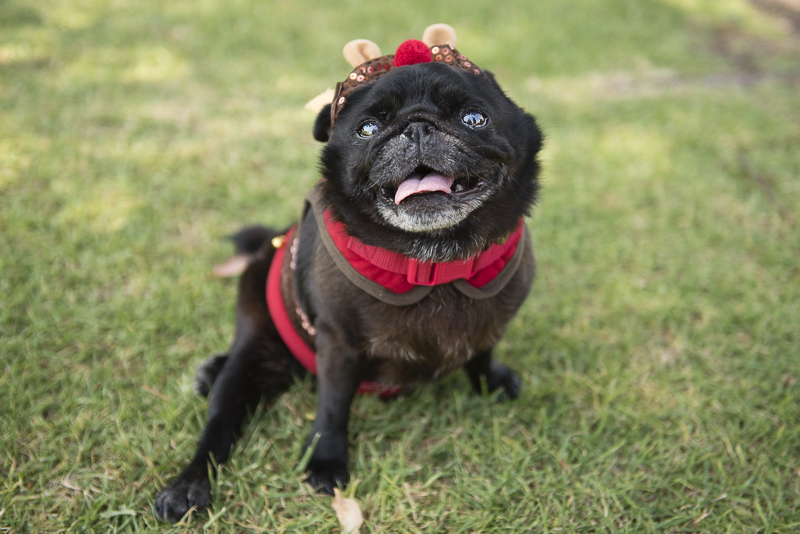 Share how your wonderful pug meet group pulled together to raise all of those funds. And definitely don’t forget to include all of the businesses that donated product and vouchers to the event. I know the charity would love to know just how many people and businesses support their cause. There is so many ways to raise funds for a charity. This is just some tips that can get you started on your fundraising journey. 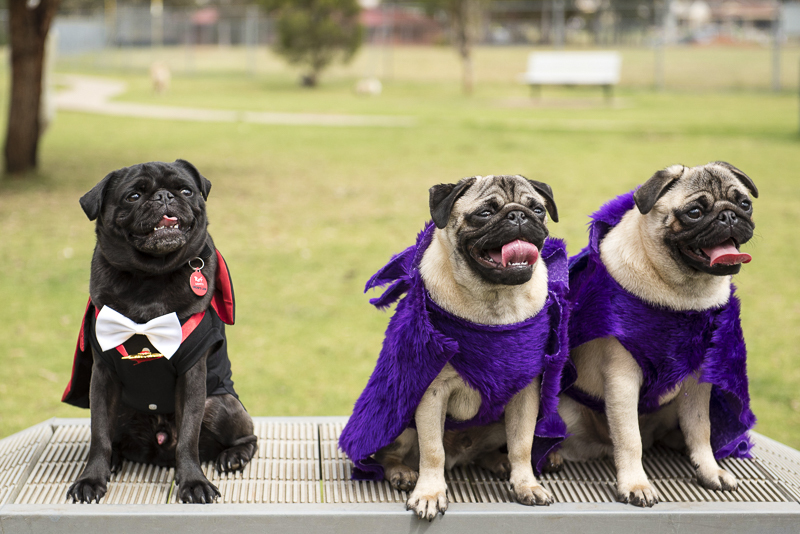 What extra tips can you provide on how to organise a fundraising pug meet event for charity? Leave your comments below with your tips.